I’ve always been interested in bee keeping. It just fascinates me how it all works and with the recent colony collapse issues happening everywhere I wanted to start my own hive but it looks like I’m a little too late for doing it this year. You have to really plan this stuff out in advance. I found all this information from a soap artisan named Martin Lopez the owner of Sweet Comb Chicago. SCC was established in a North side backyard in the Rogers Park neighborhood of Chicago. The idea behind the apiary is simply to help the bees by providing them with a diverse range of nectar away from the mono cultures created by big industry. “We have been continuously amazed and have grown smitten with the bees as we watch them go about their daily business right in our own backyard”. 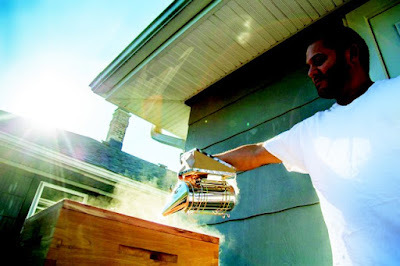 Martin goes on to say Chicago is one of the few places where the number of honey bees seems to be increasing slightly – thanks to backyard and roof top beekeepers. With you​r support, we'd like to do our part to ensure this trend continues, so please do your best to support local beekeepers. I was first introduced to the “Classic Shaving Soap” from someone’s SOTD post and after seeing that photo I became more intrigued. so I contacted Martin requesting samples. When the parcel arrived it contained a product information card, Classic Shaving Soap, Beard Conditioner, Beard Oil and Lip balm. The product packaging is stunning which carries over to the company’s website. The information card gives the product line that professional look that conveys quality. Hats off to Jeff Haner Graphic Design. 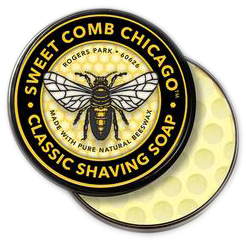 The tin for the shaving soap has a matt black finished with the beautiful honey bee logo right on top of the push on lid. The surprise for me was to discover the honey comb design pressed right into the top the soap. A nice touch. Water, Sodium, Hydroxide, Sorbitol SorbitanOleate, Soy Protein, Glycine Soja (Soybean) Oil, Helianthus Annuus(Sunflower) Seed Oil, Beeswax, Cannabis Sativa Seed Oil, Persea Gratissima (Avocado)Oil, Simmondsia Chinensis(Jojoba) Seed Oil, Theobroma Cacao (Cocoa) Seed Butter, Tocopherol, Aloe Barbadensis(Aloe) Leaf Juice,Fragrance Oil,Titanium Dioxide, Iron Oxides. When I tried to remove the top layer from the tin it was rock hard. I realized I was going to need to bloom. I’m guessing it’s because of the wax content in the soap. Since I had no room at the top of the soap for blooming I had to submerge the tin completely in warm water for about 3 min or so. This allowed me to place a generous amount into my captain’s choice bowl. Using my brush and few more drops of water I created the most amazing lather. A Thick, Rich, Creamy lather with peaks that could defy gravity. I had no problems with slickness and glide during the entire shave. The post shave feel was a great bonus as well. Let me touch on some other great products from SCC. The lip balm is a winner. After I let my wife try some she said it was hers now but I sill use it when she’s not looking. I also tried the beard oil as a pre shave and found it had a wonderful scent and helped lubricate my face although I’m not sure if this is recommended. After taking a good look at the website I’m going to order some honey and Pomade from Martin. I would order the bath soap but I’m not into lavender that much but if they start making one in the same scent as the shaving soap then I’m all in. Note - Over the past year I’ve done close to 50 articles and videos on all kinds of shaving soaps. On my videos I have a chart showing 7 categories which I rate products from a scale of 1-10. During that time, I have only given lather a perfect 10 to a few shaving soaps and this is one of them.